Have you ever wondered who was working in the press box at a live sporting event? Did you ever think that it must be the easiest job in the world? All that you have to do is watch sports, call the game and walk away with a paycheck, right? While that job sounds great, after talking to the professionals, that’s simply not the case. 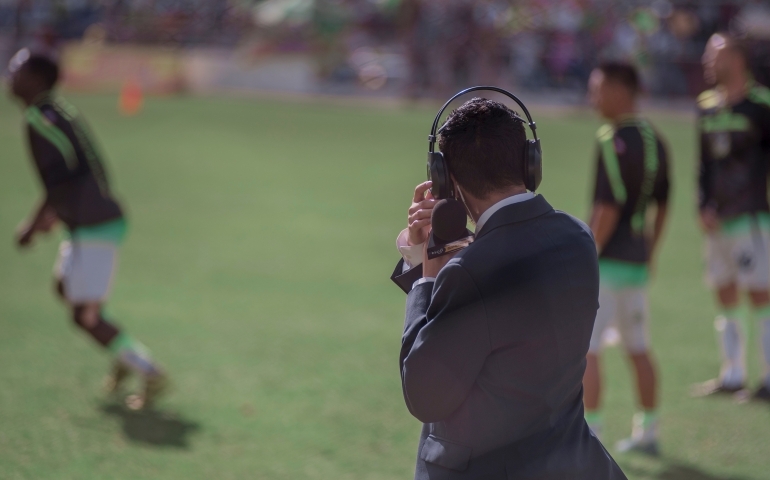 A Sports Information Director (SID) does much more than watching sports and getting paid: to be a SID, one must be a tremendous multitasker and be prepared to be constantly on the go. Multiple SID’s have said that they can easily work an 80-hour week depending on the time of year. Like most jobs, the birth of social media has brought about change in the SID career. Marketing of the team/school that you are covering is an extremely large part of the job. Everytime that they post a story, broadcast an event or are speaking about a player, team, game, etc., they are marketing the institution and the athletic teams to the audience that follows the sports and potential future recruits. With this in mind, a SID must always know about the sports topic they are speaking about when it comes to the various sports. According to SNU Director of Athletics Communications James Hill, “SNU currently covers 14 sports at the time.” Do you know the correct terminology and rules to 14 sports? At SNU, Hill and SNU Graduate Assistant, Tanner Stiles, cover all the sports by broadcasting games, announcing, recording statistics, playing the music, streaming events, taking photographs, writing game summaries, uploading stories and graphic design. This list encompasses the job duties for one game. There are multiple times that there are numerous events occurring on the same day in different locations, in which all these duties must be completed. As you can tell, there is a large amount of work needing to be done with a very small staff to carry it out. James Hill is always looking for interested volunteers. There is such a broad area in which you can gain experience by working with Hill and his staff. There are many ways in which to hone and perfect your specific skill set within the sports department at SNU. Among the numerous listed duties of a SID, there is ample opportunity for SNU students to work in a sports environment of their choosing while gaining valuable experience. Whether you are passionate about sports or not there is an available opportunity for you, the chance to gain experience in your particular field of study or just to be able to hang around a sports environment is yours for the taking. If you’re interested in this exciting experience and want further details, check out the SNU Athletic page at https://snuathletics.com/ or feel free to contact James Hill at jhill1153@mail.snu.edu .